If you have wrist pain that has been bothering you for some time, then you are at the right place. If you suffer with the Following Hand / Wrist Conditions; learn more about how Regenerative Cell Therapy can help restore your health and help you live Pain-Free! Applying too much pressure to the carpal tunnel causes the median nerve to become pinched resulting in many problems that are experienced in the wrist and hand including pain, tingling and difficulty functioning. The carpal tunnel is a pathway that runs from the elbow down to the hand. It is located on the inner aspect of your arm and houses a median nerve and many other tendons. 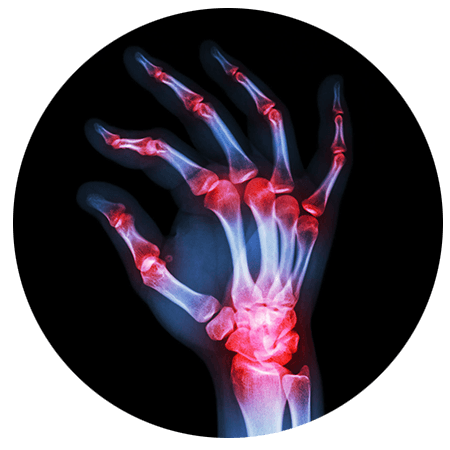 If you have the carpal tunnel syndrome and you do not want to risk the side effects associated with steroid injections or you don’t want to go for surgery, you can visit one of Front Range Regenerative Medicine’s partner healthcare providers. We offer a non-invasive alternative to steroid injections and surgery for carpal tunnel syndrome. Our partner healthcare providers will treat all the underlying issues that are causing you pain by utilizing Front Range Regenerative Medicine’s Advanced Regenerative Cell Therapy to help heal the cause of your wrist pain. We will assess your condition before coming up with the specifics of your treatment. This is because the treatment procedure depends on factors such as your age, health, etc. Arthritis of the hands and wrists is inflammation of the various tissues within the joints. Each joint is made up of tendons, ligaments, cartilage, and other soft tissues that provide cushioning where the bones meet, keeping them from rubbing against each other. When there is damage or deterioration within the joints, arthritis is likely to develop. Usually, the condition progressively develops and worsens over time. Sudden, traumatic injury to the delicate soft tissues of the hand and wrist joints can also lead to the inflammation, stiffness, and pain of arthritis. Arthritis pain can easily become a chronic condition, and becomes increasingly more difficult to treat. Despite the risks involved, many have tried prescription pain medications, steroid injections, and even surgery to relieve their pain. Now there are advanced, non-surgical techniques to reduce inflammation and arthritic pain. Regenerative Cell Therapy takes healing cells from fat and bone marrow that contains a high concentration of immune cells, healing and growth factors that help not only heal your inflamed joint but also helps to regenerative tissue. This is a same-day, in-office procedure that helps your body heal the arthritis in your hands and wrists naturally, without the need for surgery. Since regenerative cell therapy is not derived from embryonic stem cells or fetal tissue, there are no ethical issues with the treatment. Regenerative cell therapy consists of an injection directly into the painful area. The therapy has the potential to actually alter the course of the condition and not simply mask the pain. This therapy has significant potential for those in pain, and could actually repair structural problems while treating pain and inflammation simultaneously. Regenerative therapy uses cells from your own body and repurposes them in the areas needed. It acts as an immunologically privileged material, meaning it has NOT been shown to cause any rejection reaction in the body. This means there is no graft versus host problem. If you’re suffering with Chronic Hand / Wrist pain, find out if you are a good candidate for Regenerative Cell Therapy. Schedule your free consultation with our specialists today!